Once law, HB 4 will allocate grant funding to existing pre-K programs that require additional teacher training, meet specific curriculum requirements, and increase parental involvement; however, the legislation does not expand the state-funded pre-K. Currently, Texas taxpayers fund half-day pre-K for four-year-olds from low-income, English Language Learner (ELL), military, foster and homeless families. Abbott’s proposed “gold standard” program offers a grant of up to an additional $1,500 per child to those eligible school districts which agree to implement associated teacher criteria, and a curriculum determined for use in the pre-K program. The Senate adopted amendments to ensure the bill does not require the programs to be full-time, and bars any mention of the Common Core State Standards in pre-K teacher training programs, according to the Houston Chronicle. It also encourages the “high quality” programs to strive for small class sizes, and requires programs that track student achievement to make that data publicly available. The vote in the Senate was 25-6. The six senators who voted against the bill were Konni Burton (R-Colleyville), Troy Fraser (R-Horseshoe Bay), Bob Hall (R-Rockwall), Don Huffines (R-Dallas), Van Taylor (R-Plano), and Brandon Creighton (R-Conroe). Previously, the House voted 128-17, with 2 present but not voting. Due to changes made by the Senate, the bill will head back to the House. Despite legislative momentum in both chambers, HB 4 has critics on both sides of the political spectrum. For the progressive education lobby, the pre-K bill does not go far enough. Raise Your Hand Texas balks incessently on Twitter, using slick, heart-tugging online videos to demand bloated full-day universal preschool as an essential ingredient of “high quality” pre-K.
Last year, the New York Daily News illuminated the murky language of the pre-K debate by explaining that “high quality” typically denotes public school system-connected programs involving certified teachers who hold Bachelor’s degrees, and operate under a state-approved curriculum, as opposed to the Obama administration’s pre-K system of choice, Head Start. “Rigorous evaluations of the federal Head Start program have long shown that gains made during the preschool years tend to fade when children get to kindergarten and first grade. Pre-K advocates know this, which is why they say the type of early education they want to offer is ‘high quality’ and ‘full day.’ But evaluations of so-called high-quality state preschool programs have mixed results, too. In fact, studies that use rigorous, randomized designs show the same results as for Head Start: Gains do not last beyond the pre-K year,” according to the Daily News. Breitbart Texas reported Head Start is a dismal failure, according to data from the Obama Administration’s own Department of Health and Human Services (HHS). The agency found that “students who participate in the federal $8 billion Head Start program actually fared worse, in some ways, than students who do not. The study also found that positive effects of the program are not sustained into elementary school. In 2014, the Texas Education Agency (TEA) unsuccessfully competed for a $120 million federal government pre-K expansion grant, although the state was gifted $30 million by the US Department of Health and Human Services (HHS) for Early Head Start. This funding was divvied up by municipalities: San Antonio and Edinburg, each receiving $7.4 million. Dallas got $4.2 million, followed by New Caney ($2.6 million), Bastrop ($1.6 million), Bellaire ($1.5 million), Houston ($1.5 million), Austin ($1.2 million), Crowell ($1.1 million), Fort Worth ($900,000), Laredo ($700,000), and Lubbock ($500,000). These federal tax dollars had nothing to do with the TEA. Former San Antonio mayor Julian Castro’s sales tax funded Pre-K 4 SA is Head Start. The program has a 10 percent window of families that must pay a monthly tuition fee, because they don’t meet the eligibility requirements – which, as in Dallas ISD’s program, stipulate eligible four year-olds must have limited English proficiency, qualify for free or reduced lunch, be homeless or in foster care, and/or have a parent active in the military, as Breitbart Texas reported. Conversely, the conservative Grassroots Advisory Board to Lt. Gov. Dan Patrick has its own axe to grind with Abbott’s legislation, charging that HB 4 opens the door to state-mandated, taxpayer-funded full-day pre-K. They also dispute the benefits of pre-K programs. 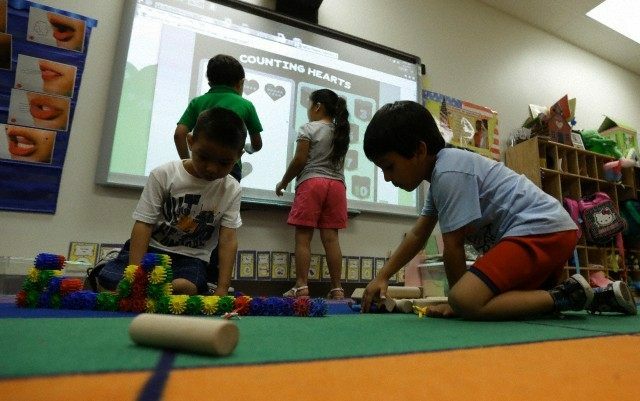 KXAN-7 also relates Governor Abbott’s recommendation that Texas should not rush into pre-K expansion immediately, but rather wait a few years, until the state can study the full impact of his plan.